On June 24, 1970, the Philip Johnson-designed John F. Kennedy Memorial was dedicated. It is located some 1,000 feet from the 1963 assassination site on a block bordered by Main, Commerce, Market, and Record streets. Ironically, one of the most solemn structures in North Texas was taking the place of an area with a far different heritage. Making reference to that past, Dallas County Judge Lew Sterrett praised the urban renewal that the project engendered, pointing out that “37 flophouses, beer joints, and whiskey stores” had been razed from the site and its adjacent blocks. This particular area, on the west end of Dallas’ central core, had a long history as a place of “ill repute.” In 1907, the city set aside an area just blocks from the Old Red Courthouse known as “South End.” Three years later, the city council decreed that houses of prostitution (“bawdy houses and bawds”) should all be located within those boundaries. The area was also referred to as “the reservation” and as “Frogtown” for the frogs that made their nightly calls in the nearby Trinity River. Frogtown disappeared by city council ordinance in 1913, but that didn’t stop the area’s proliferation of a certain kind of entertainment. 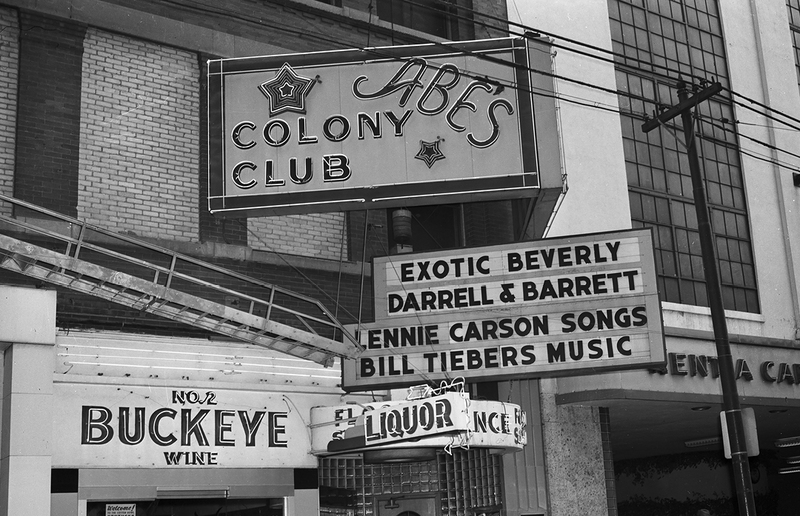 By the 1950s and ’60s, there were 12 burlesque clubs located in a six-block area of the neighborhood. The female entertainers teased their audiences with elaborate dresses and routines, stripping down to G-strings and pasties. Candy Barr was one of the Colony Club’s biggest draws; she started her act dressed as a cowgirl complete with cap guns in her holsters. In addition to a regular clientele of fraternity members from Southern Methodist University, the clubs were also particular draws for fans in town for the annual Texas-OU football game. Brothers Abe and Barney Weinstein, proprietors of the Colony Club, were kings of the Dallas burlesque world, but they had competition in Jack Ruby. Ruby’s Carousel Club opened initially as a supper club in 1960, but when business wasn’t what he expected, Ruby switched it over to striptease. It was open seven days a week until 1 or 2 a.m.
Alongside the Colony and Carousel clubs on Commerce and Jackson streets were the Montmarte Club and Theater Lounge. Across the street was the Adolphus Hotel with its own musical comedy review. The Baker Hotel was also nearby, making the area the central location for visiting businessmen—conveniently, entertainment was just steps away. This entertainment district met the wrecking ball as it fell out of favor … not just for the JFK Memorial, but One Main Place in 1968 and One Bell Plaza later in 1984. However, its history and reputation remain as one of the interesting, if lesser-known, stories of Dallas’ city development. Greg Brown, Hon. AIA Dallas is program director for the Dallas Center for Architecture.